While waiting for breakfast to arrive, we flicked around the TV, noting that Channel 9’s Today Show kept showing bits of the previous night’s Hey Hey special. After breakfast (eggs on toast x 3) we gathered up all our bags and checked out and strolled across the street to the bus stop. My Myki money was running out, so I put some more dosh on it. We weren’t actually heading home just yet, but decided to chuck the bags into a locker at the station ($2.70) and then continue exploring. We strolled back via the shops, and noted the first of a large number of Army Landrovers drive past with “Driver Under Instruction” plates on it. In the following few hours we must have seen a dozen or more of these drive past, sometimes alone, sometimes in convoy. The Hargreaves Mall in central Bendigo is being redeveloped, including some big screens which judging from a letter in the morning’s Bendigo Advertiser, are seen by some as a waste of money. Back to the tram stop. The first tram was headed down to the mine, so we caught that. On arriving there, the driver changed ends and the tram conductor urged us to cheer him as he reboarded the tram, so we and a couple of other passengers did so. Then we set off back through the centre of town and arrived a little while later at the tram museum. This time we wanted to take a proper look. The staff there offer a half-hour tour around the place for anybody interested. We and a couple of older couples took it, and we learnt about how Bendigo’s tramways got started (the first incarnation was battery-powered; they didn’t last long as they kept running out of juice on the hills, and passengers would have to push them back to the depot) and how the system was shut down and the vintage tram tour put in place. The kids wanted to do a bit of filming with the video camera in the cab of the Z1 tram, as well as at the controls of a “simulator” (which looks like it was a driver console ripped out of a tram and placed against a wall) for editing together later with other footage. I pottered about the souvenir shop and looked at the various other trams. Then we walked back the way we came, more or less, to the Chinese museum, noting more Army Landrovers passing. My dad’s parents came to Australia in the late-1800s; not to the Goldfields, but to Far North Queensland, settling on Thursday Island. (If they were anything like me, they might have planned to go to the Goldfields but decided they couldn’t be bothered going all that way.) So the museum’s history of the Chinese in Bendigo isn’t my personal family history, but it was really interesting nonetheless. The dragon, at 100 metres long, is impressive enough when dormant, but must truly be a sight to behold when it’s out and about at Easter. And we took a look at the neighbouring gardens and the temple, both of which were most impressive, and very calming once inside. 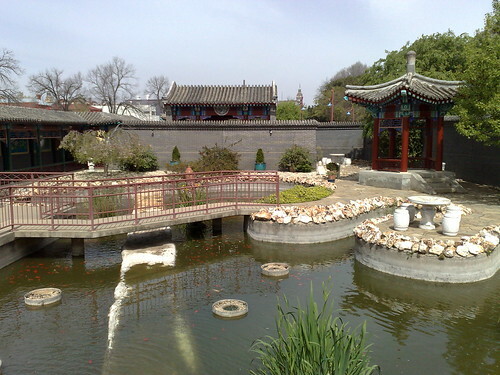 In the gardens you can feed the fish. We didn’t, but obviously plenty of people do, as some of them were looking pretty chubby. 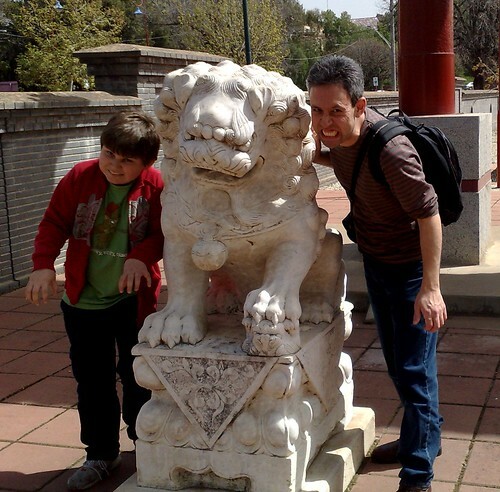 Then we headed over the bridge, through the gate, stopped briefly for a snapshot with one of the statues, and headed along the road to the Tourist Information Centre. Arguably we should have gone there when we’d first arrived, but in fact I’d researched stuff to look at online. In the basement they had an exhibit about telegraphs, as well as the development of Bendigo. One section had a video from about 2001 describing how the local council was advocating for the rail link to Melbourne to be upgraded, and also for the Calder Freeway to be duplicated. Well, the rail line upgrade was finished in 2006 (though it’s been left with mostly single track beyond Kyneton), and the Calder Freeway duplication finished this year, so maybe that video needs upgrading. Lunch was next on the agenda, and we couldn’t go past Gillies pie shop. Apparently they’ve been in business since the 1950s, and it’s not hard to see why — totally delicious, and the pastry was a joy to behold. Then we strolled around looking for dessert, which we eventually found at an ice-cream shop back on the highway, serving Norgen Vaaz, which was expensive, but tasty. By this point it was about 1pm and we were thinking about calling it a day and heading for home. A walk back to the station via a postbox and a newsagent (to buy a paper to read on the way), and soon we were boarding the 13:38 to Melbourne. It was only a two-carriage set, and already filling up. We found ourselves sitting in with a snooty lady who was steadfastly concentrating on her iPod playing The Seekers, and seemed determined not to make eye-contact. Maybe she was wishing she hadn’t tried to nab four seats to herself. At one stage the conductor went past and was heard to say to some people “Where do you live? I’d like to come around and put my feet on your couch”, which gave me warm fuzzy feelings inside. The train left on time, and filled up steadily at each stop. By the time we reached Woodend, the automated sign was still saying Kangaroo Flat, and all the seats were taken. By Sunbury the sign had been turned off, and a number of people were standing, one bloke gripping the sign to hold himself up. 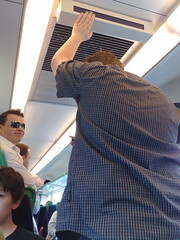 See, sometimes V/Line is just like Connex. 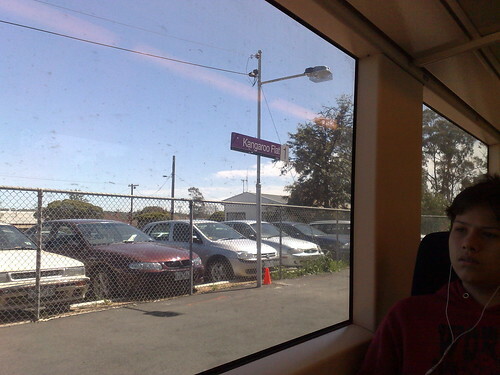 The sign-gripper was chatting to his mates about things — apparently he was a Sunbury local and a regular train traveller; the others weren’t. One asked what he thought of the electrification project — a number of Sunbury people oppose it. He seemed to have an open mind; noted that some had said the suburban trains will be slower, some faster, but he’d be welcoming the fact that there’d be more trains, and they’d run later. Good for him. 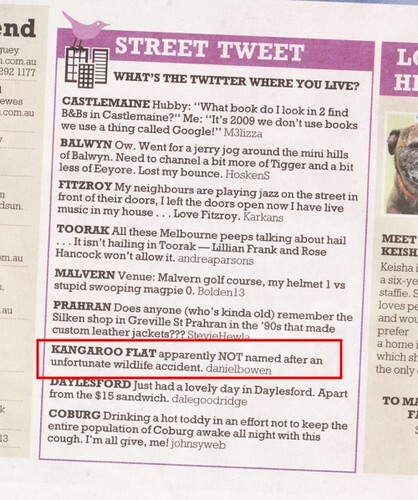 We were back in Melbourne by about 3:30, and home by about 4:30. A short trip, but an enjoyable one. Originally the plan had been to go to Canberra for 4-5 days, possibly driving up via Lakes Entrance and perhaps back via Kelly country. One of the reasons for wanting to go to Canberra was that I’d been keen to see a display at Old Parliament House: the Living Democracy: Power of the People exhibition, because part of it highlights community organisations, and one of those featured is the one I’m involved with. However, Kerryn was up in Canberra a few weeks ago, and it turns out that this is nowhere near as interesting as it sounds: merely a logo and blurb on a piece of cardboard in a display case. Oh well. 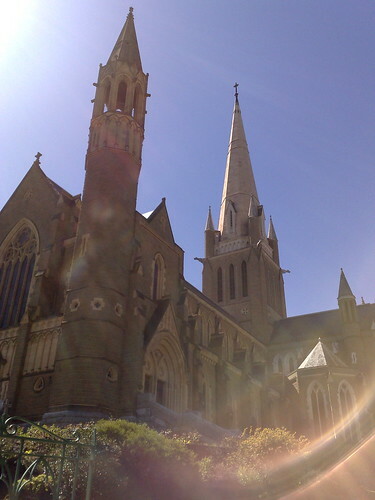 In any case, school holiday schedule considerations meant the break would have to be cut back, and I ended up with a completely revised plan: Bendigo for just two days. Short and hopefully sweet. 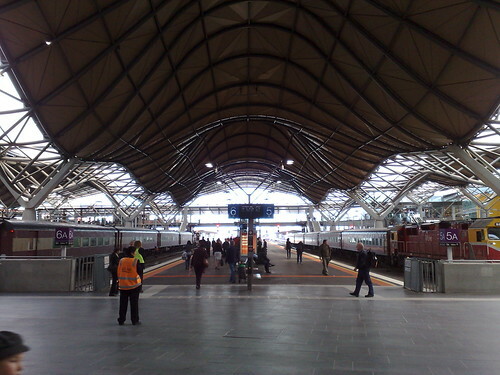 So on Wednesday morning we set out for the station, V/Line tickets to Bendigo in hand. They have a Family Traveller deal which gets you tickets for two kids free with each adult, as long as you travel outside peak hour. And it includes metropolitan travel, which frankly makes it a bargain at $15.80 each way. According to the V/Line web site, single tickets (of which we had two; they issue separate tickets unless you’re returning on the same day) are meant to be time-stamped by station staff, but both on the way and on the way back nobody seemed to think this was necessary. *shrug* Maybe they’ve realised that allowing only an hour of travel either side of your train trip isn’t very practical, especially when they advise you to allow at least 30 minutes interchange time at Southern Cross to ensure you make your connection. We got to Southern Cross in plenty of time for the 9:15 to Bendigo, and spent the time observing four promotional people dressed as the Village People, singing YMCA, with a placard nearby dubiously linking this to Hallmark Cards. The train zoomed out of Melbourne. Given it was a V/Locity train I wondered if we’d reach the full 160 km/h, but it turns out that of the two tracks that go most of the way to Bendigo, only one has been upgraded to 160, and the other only to 130, and the faster line is used for peak direction. So we had to satisfy ourselves with 130 km/h, which still seemed pretty fast from where I was sitting. In-flight entertainment was courtesy of a family sitting opposite: a lady with her three-year-old girl (“Brooke Livinia! Get back here now!”) and a ten-year-old son (who spent the first part of the trip in a long and presumably smelly session in the toilet, then the rest of the trip trying to teach his sister what seemed to be an impenetrably complicated card game). I thought they were going all bogan on me when the mum started ranting to the boy about how his father shouldn’t have “borrowed” ten dollars off him. But we got chatting later; they were doing a similar thing to us — a 2-day break in Castlemaine, sans motor vehicle, and they’d be riding the Maldon stream train. We got into Bendigo a bit after 11am and went and found the hotel. I’d booked one on View Street, which looked to be reasonably central to things, and had a room available with three beds. Despite the theoretical check-in time being 1pm, they were happy to let us into the room early, and we dropped the bags and things before heading out again. 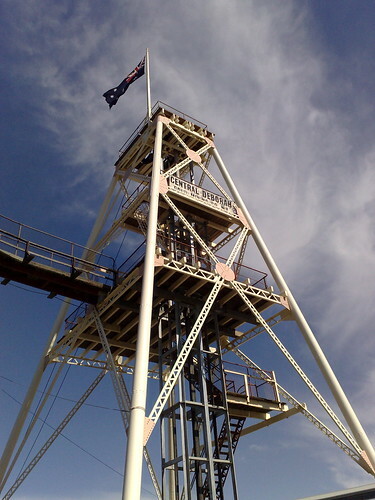 Rosalind Park is closeby, so we went and climbed the old mining tower thingy there that now serves as a lookout. Back onto View Street for some lunch, then we walked along MacKenzie Street past the awe-inspiringly huge Sacred Heart Cathedral, noting the gargoyles looking down at us. We snuck a peek inside, though a sign warned there was a service going on. A little further along the highway we got to the Central Deborah mine, where I’d booked us in for a 2pm tour. We were a bit early, so got to look around the museum and so on beforehand. 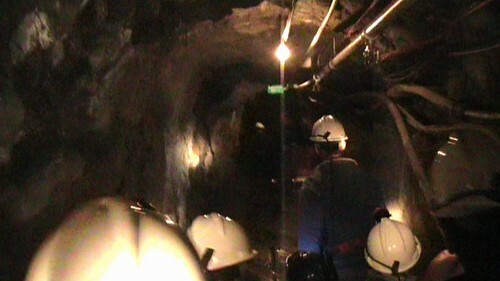 The “Mine Experience” tour was fabulous. After donning hard hats with torches, we went down in a cage to 60 metres down (the equivalent of 20 storeys) and got shown around one of the levels of the mine. Having to wear the hats and tramp about in the dark just added to the experience, making it all terrifically atmospheric, and Bob our guide was excellent, and knew how to keep the group entertained as well as informed. I can’t recommend this tour enough; the kids loved it and so did I; it was great. Back on the surface we got onto the vintage tram (it stops outside and they do combined tickets which include the mine tour and two days of riding the tram — perfect for us — $73 all up for the three of us). As in days of yore, the model we caught had no doors in the middle section, and we sat there enjoying the fresh air. The tram took us back through the city centre, with an automated voice recording describing the sights along the way. 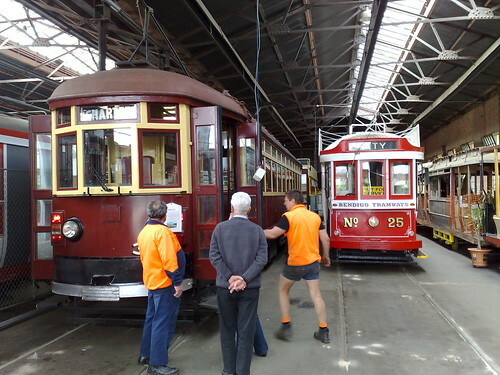 There was a short stop at the tram depot/museum, and we planned to visit it properly the next day. We took the tram to the end of the line, then back a little way to Lake Weeroona. (For some reason at some places the tram only stops in one direction.) I’d read there was an Adventure Playground there, though it was a little underwhelming. The tram conductor had warned us we had been on the last tram, but we had a plan. Bendigo’s bus network is reasonably fathomable (unlike, say, Geelong’s used to be, and partly still is), and thanks to the miracle of technology, it’s very easy to check bus times on the Metlink Mobile site — well at least it was as soon as I worked out that Bendigo is in their “Lodden – Mallee” category. Hmm. Still, simply noting the route number (8) on a nearby bus stop, and checking the times, we were able to know that there was a bus back to the centre of town every half-hour, and when it left. The bus was dead on time, and I dug out my Myki ticket from Geelong which still had $3.20 on it, which worked like a charm (though the scanners were a tad slow), and got two 2-hour short-term tickets costing $1 each for the kids. Easy. Back in central Bendigo, we went and found some pizza for dinner, and while we munched I tried to determine where the nearest supermarket was. Being the age of technology, rather than just ask one of the waiters, I tried White Pages online on my phone, and found there was a Coles just a couple of minutes walk away, where we picked up some bananas to eat later. Back to the hotel, we put our feet up. I tuned into the Hey Hey It’s Saturday reunion, which I might blog about separately later. Eventually it was bed time, and we dozed off, a good day’s exploring behind us.